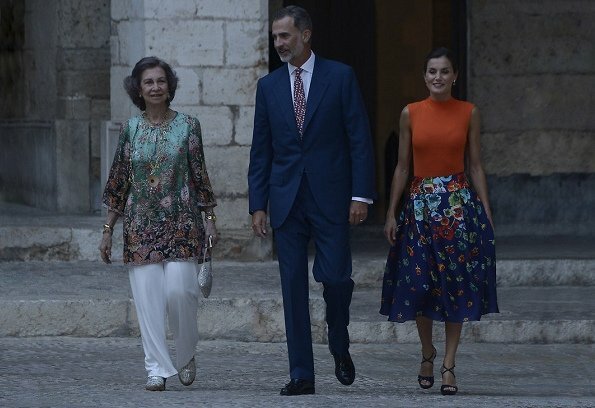 On August 3, 2018, King Felipe VI, Queen Letizia and former Queen Sofia of Spain hosted the traditional summer reception for the authorities of the Balearic Islands and representatives of the local society, at the Royal Palace of La Almudaina in Palma de Mallorca. (Queen Letizia wore a knit wool top by Hugo Boss). I’ve never seen anyone besides a blonde look good in orange. The too ornate skirt drowns her figure. Not my taste. Mary makes it look so easy. La falda le queda muy grande. Y el top, habitual en ella, marca demasiado lo que lleva dentro. Gorgeous, fresh and elegant - all in one. Queen Letizia raises the bar. Love the colour combination, really flattering, though I prefer the dress instead the orange top with the skirt. A really tight top and a wide flouncy skirt make for a disjointed look. I don't understand the appeal (or feel) of tops that are so tight. The colors are beautiful, but otherwise not a good look. Letizia's top is a bit too tight and the skirt is a bit too long. I don't care for the color combination. I like her better with her hair loose. Sofia's pants are ugly, too big and too long. Felipe looks good. The top looks the same on the model. Knit fabric fits close to the body. The wide legged pants are in fashion this season, and Sofia's hems fall at exactly the same point as her son's. The king's street style has looked wrinkled, bordering on shabby with the repeated dad jeans during this trip. The litany of flowered and pink ties do not scream world leader either. Letizia looks fantastic! Orange and blue are very complimentary. The form fitting top pairs so well with the full skirt. Orange is not an easy color to wear, but Letizia pulls it off. Her skin tone is dark enough. The skirt is beautiful, and I can see her pairing it with other blouses. Former queen seems to be stuck in a rut with her wide leg pants and tunics. I like the skirt very much but I think the top is too tight! And I don't like Letizia's shoes! I like Letizia's outfit although I do.prefer the dress pictured. I love orange - very bright and summery. Sofia looks nice too - I really like her tunic. Precioso conjunto, colores brillantes, muy veraniegos y favorecedores cuando se está bronceada. Mucho mejor la falda que el vestido completo, que se ve demasiado "lleno" de flores. Y no le está grande, es que el estilo new look de Dior es así. La figura delgada de Letizia le permite ese volumen. Bien pensada la coleta, hacía mucho calor. 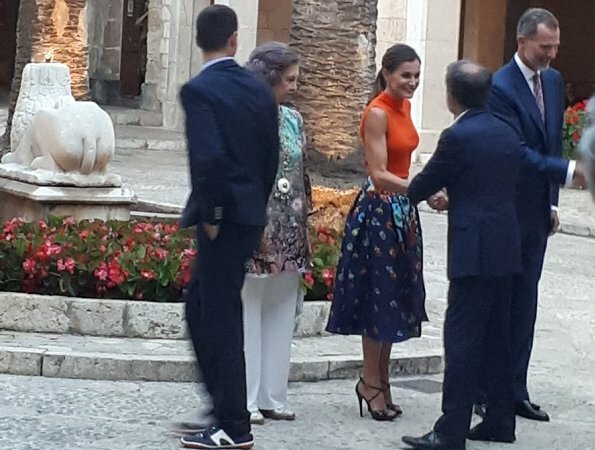 Letizia carries difficult color fine, but those shoes with cobblestones, oh dear. These two pieces look totally random together. They clearly don´t belong together, and I don´t care if the top picks up a colour from the skirt; the material, the silhouette, the pattern and design - all vastly different. 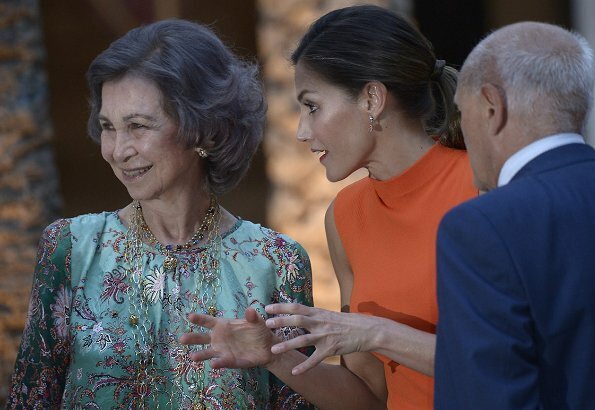 The dress on the modell is quite nice (beautiful and coherent look), whereas Letizia´s outfit is off. The pieces by themselves aren´t bad, just not together, and that even includes the shoes, imo. Queen Sofia looks very regal in her ensemble. 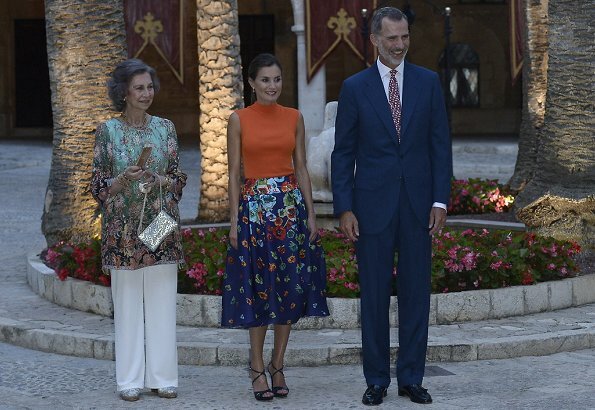 Personally, I like the outfit Queen Letizia is wearing. She wouldn't wear something like this on an official outing but it's summer and I think she wears it well. All 3 of them look relaxed and seem to be enjoying themselves. I'm clearly in the minority here but I like all three. The King definitely looks better in smart clothes, I like Sofia's outfit---She is a good few years older than I, but for ladies of a certain age, light weight wide legged trousers are a fantastic summer staple---and I think the colours in the top suit her very well. I like Letizia's outfit, think the colours blend beautifully and also like the shoes but think she needs a better bra below the tight top. Personally I love the orange top and skirt as shown. Nice to see them all (apparently at least!) happy together. 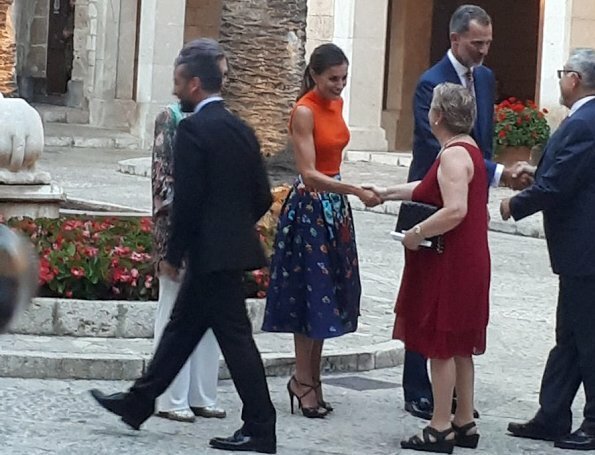 La reina Sogia:impecable; Letizia me gusta la pollera (aunque parece grande)con el vestido quedaría mejor, el buzo naranja no me gusta.. pero es verano, Felipe un puño de la camisa sobresale correctamente, el otro no..
Hey Teresa, are you now measuring the length of the king's cuffs. You are aware that while moving and shaking hands, clothing tends to shift a little right? SMH!! Busy large prints don’t look good on small women, they make them look even shorter. The silhouette of the skirt also drowns her in a sea of busy fabrics. The idea of combining navy and orange is indeed a good one, just not the best for her size. Indeed, like others have pointed out above, Mary rocks this look. She is also 10 centimetres taller. Makes all the difference. I am not sure what exactly are folks seeing unfit in the king’s outfit. The way I see it, he carries himself with all the dignity and confidence required and his suits and ties are great classic craftsmanship. Surely better dressed than certain so called leaders with terrible long red ties or those with ridiculous stripped socks. Queen Sophia is surprisingly not her usual stylish self. Can’t say that I am impressed by her choice for this event.